This Deluxe 25th Anniversary Editionincludes three CDs, two collectible booklets, and features the first ever authorized DVD release of a concert from the record breaking BAD tour. We received this set to review and think it’s a great addition to our music collection. It would also e a great gift for that fan of Michael Jackson on your list. DVD – Michael Jackson’s legendary July 16, 1988 concert at Wembley Stadium in London. This DVD is not a compilation of performances, but rather one complete show, exactly as Michael performed it for Prince Charles, Princess Diana and the 72,000 fans who were in the audience for that night’s sold out show. The DVD was sourced from Michael Jackson’s personal VHS copy of the performance as shown on the JumboTrons during the concert. This footage was only recently unearthed and is the only known copy of the show to exist. The visuals have been restored and the audio quality enhanced so that fans can share in the excitement of that famous night. CD1 – The original re-mastered album. CD2 – A CD containing previously unreleased material recorded in Michael’s personal studio at Hayvenhurst. This material includes early demo versions of songs from the album as well as demos for songs not included on the final album. All of this material is being released as it was recorded during the BAD sessions. Nothing has been added or changed. In addition, this CD also includes new remixes from internationally renowned DJ/producers. CD3 – A CD showcasing the audio from the sound truck recordings of the July 16th Wembley performance. The first-ever live Michael Jackson CD to be released, this is the only concert from the BAD Tour known to exist on multitracks. 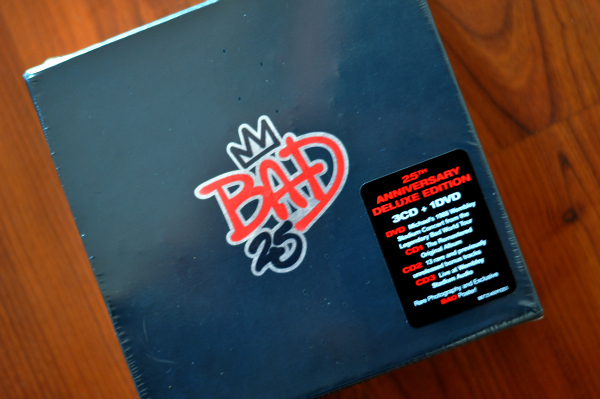 The Michael Jackson Bad 25 CD Collection is a must have item this year for any Jackson fan!